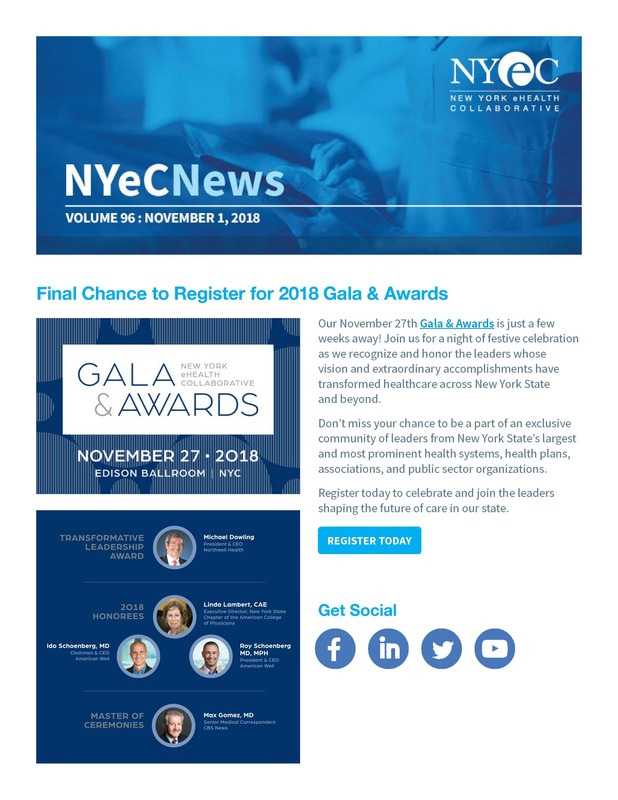 Home » NYeC News: Final Chance to Register for the 2018 Gala & Awards! NYeC News: Final Chance to Register for the 2018 Gala & Awards! Our November 27th Gala & Awards is just a few weeks away! Join us for a night of festive celebration as we recognize and honor the leaders whose vision and extraordinary accomplishments have transformed healthcare across New York State and beyond. Register today to celebrate and join the leaders shaping the future of care in our state. This month's news also includes updates from the Data Exchange Incentive Program (DEIP). The New York State Department of Health, with support from the Centers of Medicare & Medicaid Services, recently granted a two-year funding extension for the program. DEIP provides funding to eligible healthcare providers to connect to one of the state’s Qualified Entities and exchange health data through the Statewide Health Information for Network (SHIN-NY). We also shared the poster we recently presented on the SHIN-NY as an innovation and a creative way to improve patient outcomes through social determinants of health as a part of the New York State Department of Health’s Social Determinants of Health “Call for Innovations’ Initiative”. Learn more and check out the poster! Other top headlines included a recap of National HIT Week, how care coordination technology helped one network address social determinants, and tips on investing in population health. You can also stay up-to-date on NYeC’s Healthcare Advisory Professional Services (HAPS) team.